New Fire Station Grand Opening - PWArchitects, Inc.
Excerpt from a post on ConnectMidMissouri.com: “Some Jefferson City firefighters have a new place to call home. The new Station 3 is located off Highway 179 just north of Truman Blvd. It replaces the old facility on Industrial Drive, which was built in 1967. The new location is crucial for reducing response time when a call comes in. “Moving this station from where it was on Industrial Drive to here now has covered that gap area that was wide open before,” said Captain Tim Young. “So we’ve covered a large chunk of territory now simply by moving this station. 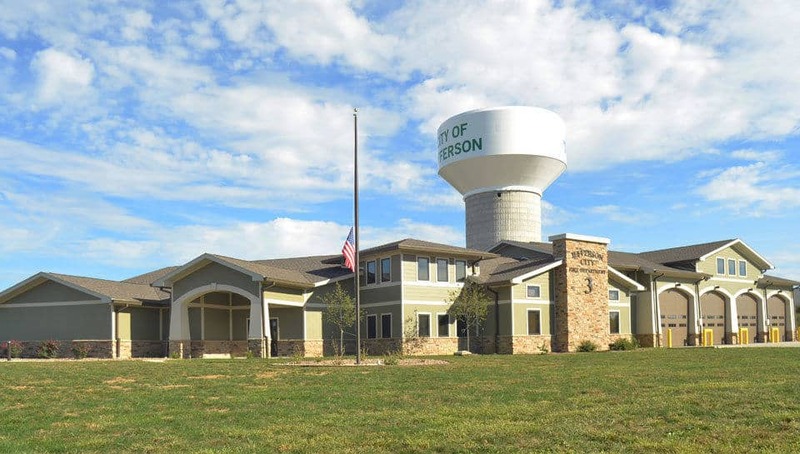 We’re able to give more citizens that four-minute response that they would need.”.” The Jefferson City Fire Department follows standards set by the American Heart Association. Ideally, if someone goes into cardiac arrest, responders should arrive within four minutes. According to Captain Young, the first few minutes of a fire are also the most crucial. Not only is the station at a better location, but it also provides updated amenities for hard-working fire crews. Inside, you’ll find a comfortable living room, updated kitchen, workout room, and bedrooms. Each of the eight bedrooms can accommodate three firefighters. But since they’re on split shifts, everyone gets their own privacy. The firefighters are finally settled in and grateful for their new home. “It was a team effort on a lot of peoples’ part and we’re very thankful for that,” said Capt. Young.